Okay so I only did two “proper” reviews on the site but as part of the 2019 refocus of Pennonia I decided to take things more seriously and come up with my own standardized process because I’m sure everyone values consistency and it’s basically needed to somewhat compare inks between themselves. So actually this first post will feature the “prototype” page I have created and the actual standard post will come after the next review (although only the presentation is slightly different). 4. Optional: Some product/studio shots if I have the time to set up the lights, camera etc. My monitors are color calibrated so I’ll try to match the inks as closely to what I can see in real life, but it’s really hard to get them to look like as they do and not to mention that everyone’s monitor displays color slightly differently. 1. Paper: For my paper I chose Rhodia 80g/m2 (DOTPAD No 16) because I think it’s a fairly accessible paper and it seems highly regarded in the eyes of most people. I’m sure it won’t satisfy everybody’s needs but I don’t want to complicate things for myself by using different brands as there are simply way too many of them. 2. Writing test: This will be done using capital and cursive handwriting. I think both are necessary because capital letters show shading more easily due to the fact you have to raise the nib a lot more than using cursive (where you can write down whole words without lifting the pen). 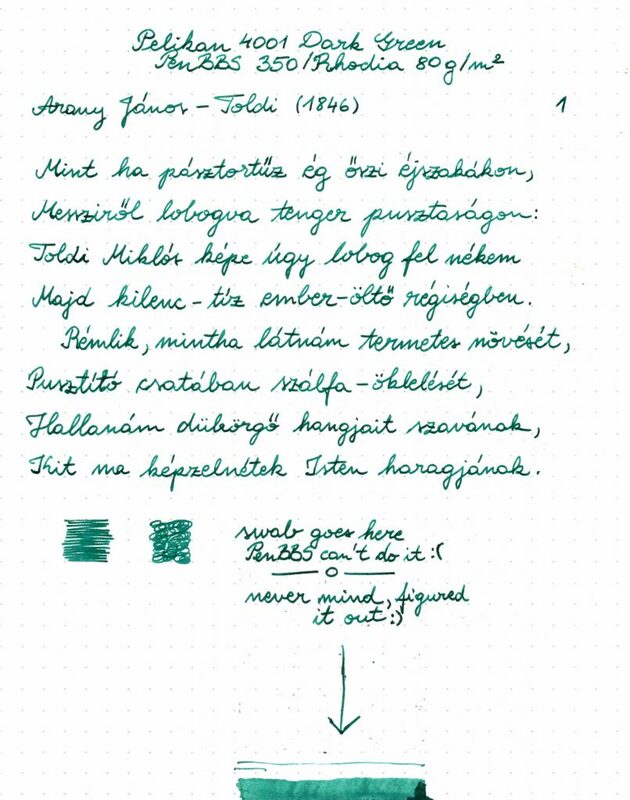 I chose to write down one of my favorite childhood ballads: “Toldi” by János Arany. Each review will feature one stanza. I will choose a random pen from my collection to write it and I won’t do different nib sizes. 3. Very rudimentary doodles: Literally a square drawn with lines and a square drawn with circles/loops. 4. Ink swab: Ink swabs are an integral part of most reviews and I wanted to include them in mine as well. Over at the Pen Addict slack user @Inkantadora suggested that I should turn the pen over and just drag the nib across the page instead of using a cotton swab and I have to say it’s a great idea because it’s super fast, doesn’t waste ink, no risk of contaminating your bottle and personally I think it spreads the ink more thinly so it’s not that unrealistically saturated. Pelikan doesn’t really need introduction since they are one of the most popular brands in the stationary world. The reason I chose the 4001 Dark Green is because I honestly have never seen it mentioned or talked about in discussions. Everybody is preoccupied with the latest and greatest inks on the market yet here we have an affordable and quite good ink on our hands and nobody ever recommends it. 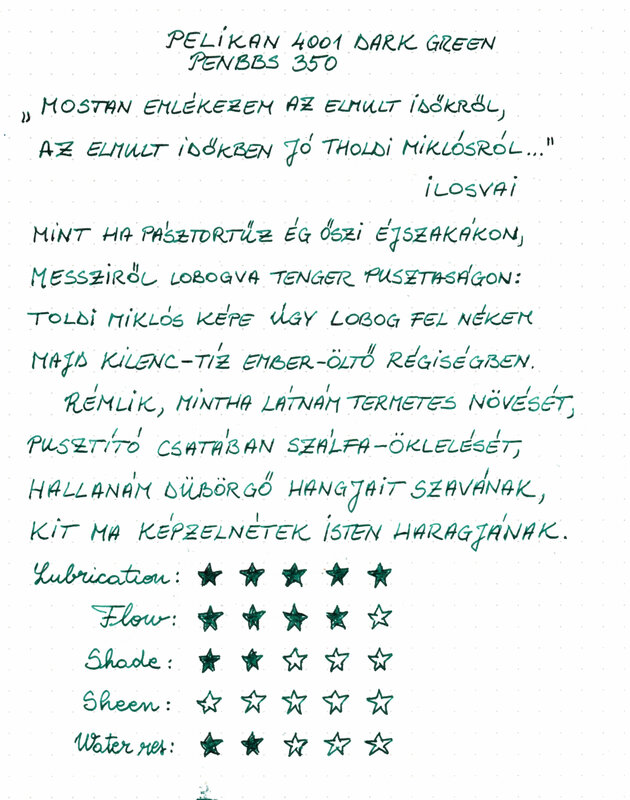 I actually have a lot of writing time with this ink because I’m using it at work at the moment (with an emerald Leuchtturm1917 and green PenBBS 350 – you gotta color match your stationary) so my impression of it is not just based on the two pages I wrote with it on the review page. The ink comes in the standard Pelikan glass bottle so nothing fancy here, but I personally favor glass over plastic even though it’s not as convenient. 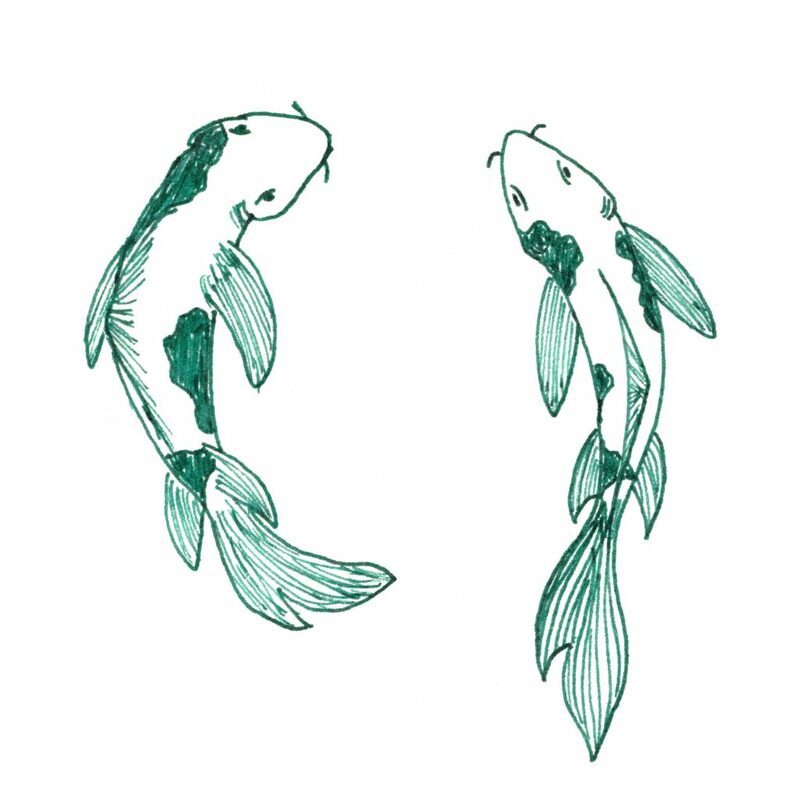 The color of the ink leans towards the bluer spectrum and is true to it’s name as it is indeed dark green. Since the ink shades you’ll be able to see that if the ink pools at the end of the strokes it can look almost black but the green is always visible at the beginning of them. I’m personally neutral when it comes to the color of the ink, I neither dislike or like it. On the other hand writing with this ink is so good! I find the flow and lubrication to be really nice and writing with it is really satisfying. It doesn’t skip and is very consistent. At this point I’m ready to only use this ink in the Leuchtturm1917 notebook until I finish it. The good thing is that it’s also really cheap so anyone can try this ink out without breaking the bank. Thanks for checking out the review! I hope it was helpful and informative! Check back again to catch up on new reviews or hang around in the Pen Addict Slack where I’ll post whenever I make a new one. See you until next time!